Virtual Class helps you to understand the VMware NSX concepts in simple way. This is my second post and hope it will be helpful for NSX Aspirants. You can find Class 1 here about replication modes. Today let’s see how cross-vCenter NSX works as people are talking about live migration of VM from Data Center 1 to Data Center 2 without loosing network stats. So in future you will receive a Customer request to migrate VM’s between Data centers 🙂 Let’s see how VMware is able to achieve this cross-vCenter magic. In a cross-vCenter NSX environment, you can have multiple vCenter Servers, each of which must be paired with its own NSX Manager. One NSX Manager is assigned the role of primary NSX Manager, and the others are assigned the role of secondary NSX Manager. The primary NSX Manager is used to deploy a universal controller cluster that provides the control plane for the cross-vCenter NSX environment. The secondary NSX Managers do not have their own controller clusters. The primary NSX Manager can create universal objects, such as universal logical switches. These objects are synchronized to the secondary NSX Managers by the NSX Universal Synchronization Service. You can view these objects from the secondary NSX Managers, but you cannot edit them there. 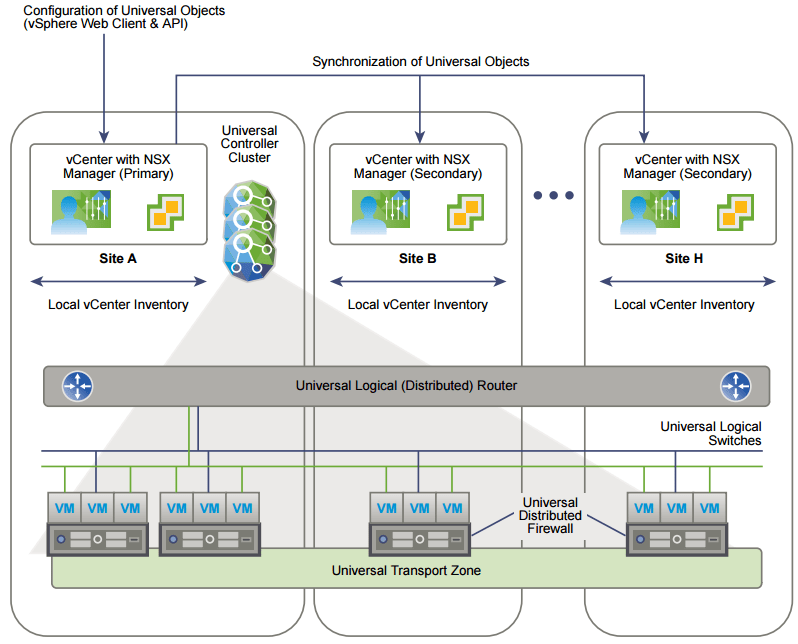 You must use the primary NSX Manager to manage universal objects. The primary NSX Manager can be used to configure any of the secondary NSX Managers in the environment. On both primary and secondary NSX Managers, you can create objects that are local to that specific vCenter NSX environment, such as logical switches, and logical (distributed) routers. They will exist only within the vCenter NSX environment in which they were created. They will not be visible on the other NSX Managers in the cross-vCenter NSX environment. NSX Managers can be assigned the standalone role. This is equivalent to pre-NSX 6.2 environments with a single NSX Manager and single vCenter. A standalone NSX Manager cannot create universal objects.